I love, as a writer, that it was because of a work of literature, that the dark face of Truganini – heavy with history – came to be painted on a grey wall in Norway, staring down its many whitenesses – some beautiful; some less so. That it was a thoughtful American scholar, Jared Diamond, and his book Guns, Germs and Steel that inspired a young woman from the Basque county, living in Bergen, to recreate in paint and ink the image of the most famous Tasmanian aboriginal; to continue the story; to renew the story; to affirm this story as a global one. I love, as a designer and dabbler in drawing, that the image of Truganini carries through history (and history books) in ways that words never could. And there is something beautiful about the cyclic nature of words and images: the way pictures can inspire such prose and poetry; which inspire new images; which inspire new words; and on and on, in the perpetual motion of inspiration. As an amateur photographer trained in the 1990s in the ways of negative, enlarger, exposures and chemicals, I am fascinated by the process used in 1866 to produce the print of Truganini's photo. And here's what really brings the sparkle to my eye: when the liquid silver nitrate interacts with the table salt in the albumen emulsion, silver chloride forms; and then, when exposed to light, this silver chloride decomposes; and with fixing, the chloride is washed away. This means that all the blackness in the image is pure metallic silver. 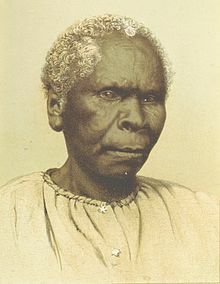 This famous image of Truganini is precious – precious – in so many ways. I love that the black in her portrait was not just black paint – but ink – so typically used to create text, there, on that indistinct wall, it was used to outline and define the features of a face long since blurred by history, leaving an indelible mark on my life. I love that Ariadne brought in the purple tint of feminism to Triganini's black-and-white image passed down to us through so many men's hands. 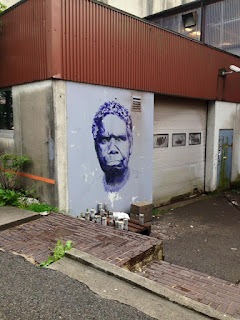 I love that her mural has never been tagged – Truganini's face never defaced. I love that on the other side of my second marriage; on the other side of the globe; seeking a new bearable lightness of being in the bright Norwegian evenings, I stumbled upon an emblem of the black history of my homeland – a symbol of lastness, lostness and death. And there, on that chill light night, I was transported back to all that was Taswegian within me – from the bare and parched to the lush and fecund. It was a sort of homecoming. And I felt myself falling into the past as if falling in love. It was hardly a choice. 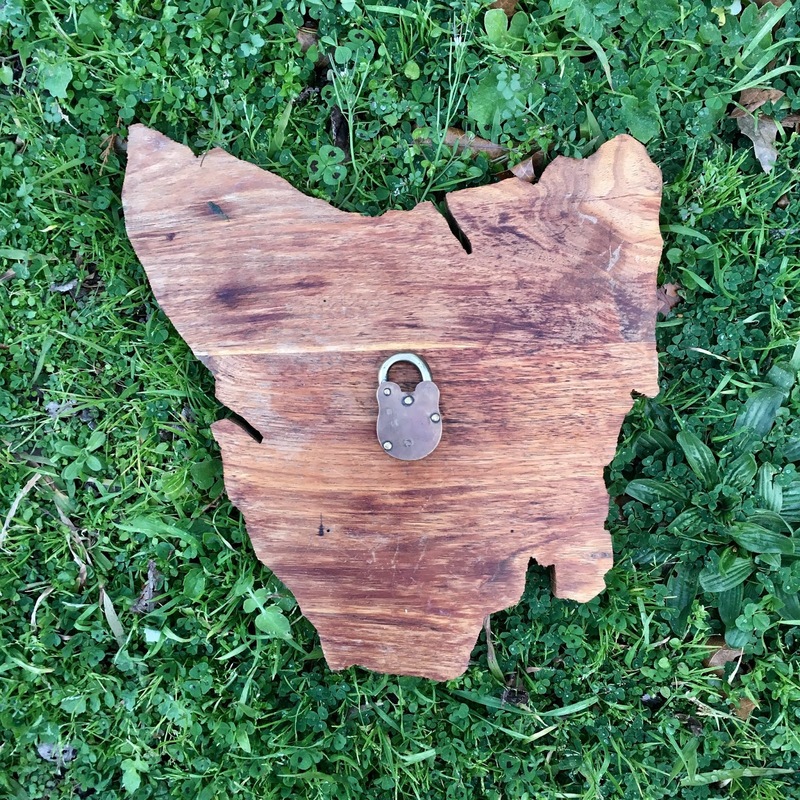 I love Tassie – I can hate it too (like any impassioned lover) – its topography shaped the contours of my life; its weather cultivated my deep sensitivity to seasonality and my inclinations for fog and fern; and its islandness shaped the ragged coastline of my identity. 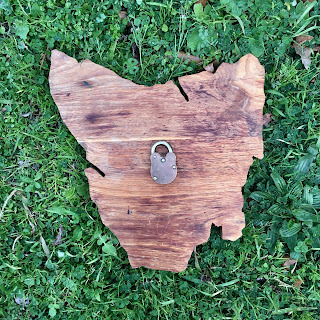 But it feels too much to still call myself a Tasmanian, because I haven't lived there for 23 years; and calling myself an ex-Tasmanian feels too dismissive and absolute. Sometimes, when people ask, I say I'm originally from Tasmania. But whenever I say that, I am also aware of how original I am not.